The Greenwich programme has now ended. Thank you to those who participated in the programme. Please visit the 'programmes' tab in your BetterPoints menu to see what national challenges are available to you. We do hope to bring more funded programmes to your area in future. It's easy to be rewarded for doing things differently. Earning rewards and helping make a positive difference is now just a click, touch and a swipe away. Up to the minute news and stories from reward programmes in your local area. Record your activities to earn BetterPoints. Share your activities on Facebook and Twitter to earn more BetterPoints. Reward yourself! Spend your BetterPoints on high street vouchers. Give your BetterPoints to your favourite charity or cause, globally or locally. Scan codes for bonus BetterPoints, update your profile, and access the Partner Centre if you're a business.
" Just wanted to say a huge thanks to your team. What started out as oh well lets see if I can earn the odd voucher has genuinely changed my habits! I'm walking every day even in this weeks snow and hoping to convince my husband to ditch the car and walk more!" -Liz, Birmingham "
" This app is amazing and I have lost so much weight because of this app! 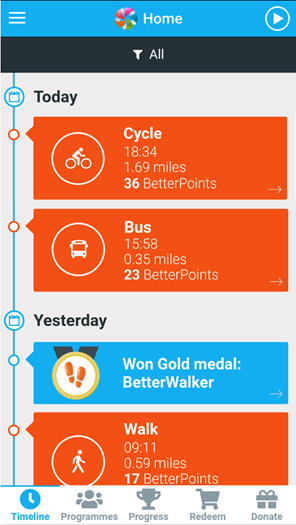 :) "
" If ever I need an added incentive to stay active and get myself out the door, BetterPoints provides me with that! Give it a go, you've got nothing to lose! "